The London Marathon was won seven times in 12 years by athletes who have recorded suspicious blood scores, according to the Sunday Times. The tally represents nearly 30% of winners in the 24 men's and women's races. Last week the newspaper - along with German broadcaster ARD - revealed details from a leak of 12,000 blood test results from 5,000 athletes. The latest revelations focus on what the Sunday Times calls "the alarming extent of suspected cheating by elite athletes in the six mass public marathons around the world." London, Boston, Chicago, New York, Berlin and Tokyo are the races to which they refer. The winners of 34 major city marathons - one in four - "should have faced censure or at least been investigated over evidence of potential blood doping within their test results." Athletes whose results were considered suspicious by the Sunday Times's experts collected more than £4m in prize money from those marathons. In London, seven wins, six second places and seven third places were secured by "athletes whose blood tests were deemed suspicious by the experts". The files belong to world governing body the International Association of Athletics Federations (IAAF), but have been leaked by a whistle-blower. London Marathon chief executive Nick Bitel said the IAAF has agreed to increase out-of-competition tests for athletes at the world's six major marathons, but criticised the organisation. "We are disappointed when we have been doing more than anyone to fight doping in our sport," Bitel told BBC Radio 5 live's Sportsweek. "This is about the IAAF's failure to take effective action." Two of the world's "foremost anti-doping experts", scientists Robin Parisotto and Michael Ashenden, have reviewed the data. According to them, a third of the medals claimed in endurance events at World Championships and Olympics were won by athletes with abnormal or suspicious blood tests. It is claimed none of these athletes have been stripped of their medals. Parisotto said he had never seen such an abnormal set of blood values. "So many athletes appear to have doped with impunity, and it is damning that the IAAF appears to have idly sat by and let this happen," he said. The evidence is not proof of doping, but the revelations will raise more serious questions over whether the sport is doing enough to combat cheating ahead of the World Athletics Championships in Beijing later this month. London Marathon chief criticises IAAF Analysis: Can Lord Coe fix athletics' damaged reputation? On Friday the World Anti-Doping Agency (Wada) announced that it would launch an "urgent" investigation into the allegations. The IAAF has agreed to hand its full database - seen by the BBC - to the anti-doping body. In a statement, it said: "In sharing what we believe to be the database in question with the Independent Commission formed by Wada, the IAAF is comfortable that an independent, impartial assessment of the data and the follow-up action by the IAAF will now be made by the competent authority." This week, the IAAF is set to strip a number of athletes of medals won over the last decade, the BBC understands. This retrospective action - or "delayed justice" - will be a result of the re-testing of old samples and analysis of blood passports. However, the IAAF has condemned the leak, and insists that the two experts had "no knowledge whatsoever of the actions taken by the IAAF in following these suspicious profiles" and that their analysis "contains a number of seriously incorrect assertions". It added: "Of most concern to us is that the two scientists continue to defend their statements that the IAAF did nothing to act on 'suspicious profiles'. "If these scientists have evidence that the IAAF did not follow up suspicious samples, then they should immediately make this available to the Wada Commission. "If they do not have evidence, then we urge that they refrain from making assertions of wrongdoing." The IAAF also said that Ashenden and Parisotto "conveniently ignore the fact that more than 60 athletes have been sanctioned on the basis of abnormal blood values collected after 2009, and these athletes accrued 140 notable international medals, three world records, six world marathon majors wins, 13 other big city marathon wins before they were exposed by the IAAF as cheats". The IAAF said that before the introduction in 2009 of the biological passport to monitor blood values, its testers had "systematically pursued" all results that were deemed "atypical" with immediate urine tests for EPO and then target-tested those athletes in and out of competition. "We condemn the fact that two experienced scientists were naive enough to place themselves in a situation where their analysis of incomplete data is being used against athletes in the public domain," it said. Since the introduction of the passport, the IAAF says it has "pursued more cases under the passport system than all other anti-doping organisations together", and is spending $2m a year on combating cheating. "As a percentage of overall annual budget this is the highest of any sport," it added. There can be various reasons for abnormal blood samples other than performance-enhancing drugs. Illness, altitude training and pregnancy can all influence values. The Sunday Times reports that eight British athletes - including Mo Farah and Jo Pavey - have published their blood test data "to show they are clean" with results falling within the normal expected range. "I'm happy to do what it takes to prove I'm a clean athlete," said double Olympic champion Farah. "The decision to release my results is a personal one." Pavey said: "It's nice to get it [her blood data] out there, as a clean athlete I've got no reason not to." UK Athletics said it was "counselling caution" to athletes because "full transparency requires release of all of an athlete's testing history rather than incomplete data that has the possibility of being open to misinterpretation." It added: "Athletes that have chosen to allow their results to be published have in many cases asked for guidance before agreeing to do so, in order to be better informed of any risks involved." 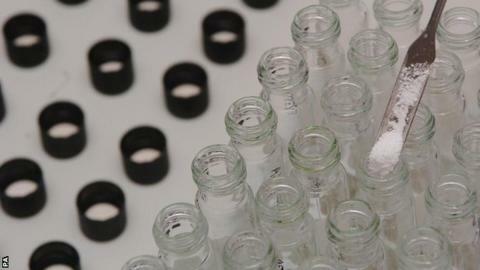 UK Anti-Doping said it has a "robust" Athlete Biological Passport system in place and is "confident" in its procedures. On Friday a former winner of the London Marathon was stripped of her title for doping. Russian Liliya Shobukhova, who won in 2010 and was runner-up in 2011, has had her results since 2009 annulled. The Sunday Times claims that she recorded "extreme blood scores" for nine years before the athletics authorities finally took action against her in 2014, and that marathon organisers were not told about the scores.